Due to the nature of a true custom leather belt business, people coming across our website can have a lot of questions. This is certainly expected because there are so few leather shops actually doing what we do anymore. In the course of our daily interaction with inquiries, we communicate with a lot of people. Here is a list of frequently asked questions and answers that might fill in some of the blanks about our business and products. Do all your belts have a lining or is that a custom expense? For instance: I am interested in a hand-tooled leather belt, buck-stitched, with my name on the back. Would that belt have a lining or is it just the one thickness of tooled leather? The lined and stitched option is extra ($65.00) - yes. Some people add it for extra strength if they are historically hard on belts. We use 10 oz veg tanned cowhide in all of our belts and that seems to be plenty for most people. Size is a big factor in this decision. If you are over a size 38" and you have a history of the belt bending badly in the area of the center keeper in the back, we would highly recommend the lined and stitched option. If you are a 34" - 36" or less and your belts typically don't bend in the back then you likely don't need it. Buck-stitching does not have a lining as a part of that feature. It typically is just an added decoration and has nothing to do with added strength. I wear a Trophy buckle with my leather belts right now. If I add one of your 1" or 3/4" buckle sets to my custom belt order, do I need to do anything extra to make sure the size I give you is correct? Really good question - the quick answer is yes there is a big difference between the size of an average trophy buckle and a 1" or 3/4" buckle set. Most trophy style buckles will take up in the neighborhood of at least 3.5" of length in the overall size (length) of the belt. If you plan to use the same buckle on your new belt that you have been using on your old belt then you have no problem. The new belt will fit just the same as your old belt. Use our measuring system to determine your belt size. If you have been using a trophy style buckle on your old belt (the belt you measured for size), and you want to use a smaller 3-piece buckle set (buckle, keeper and tip) on your new belt that we make for you, here are the steps to help you determine the adjusted size for the new buckle set. 1) Determine your size using your old belt with the trophy buckle on it. 2) Determine the difference in length between the two buckles. (Generally speaking, the amount of space that a trophy buckle takes up in a belt is around 3.5". The buckle from a buckle set will usually take up around 1.5" - 2") . 3) Add the difference between these two buckles to your size measurement. So if you determined that your size with the trophy buckle was a 38", and the difference in length between the two buckles is 2" - then you need to order a size 40" belt. **** If you plan to do the opposite - if you have a smaller buckle set on your old belt that you measure for size and you want to use a trophy style buckle on your new belt, then you would subtract the difference in buckle length from your size. So in that case, instead of a 38", you would order a 36" belt. If this is all making your head hurt and you need help, please call us at (406) 285-2521. I like buck-stitching a lot. Can I also have a backer added with the buck-stitching? Installing buck-stitching on a belt with a backer glued on is not impossible, but it is very difficult to accomplish using our methods. I am sure there are good craftsman out there that can do both, but it is not a fun job at all in our shop. For that reason, I will say that we will likely not do it. If we did we would have to charge too much money for the time and grief. We buck-stitch by hand using one extremely long piece of lace - feeding the end of the lace through the extra thickness of leather is a bear cat! So the long answer is this - we would greatly prefer that you choose buck-stitching or looped lacing as a single feature OR our lined and stitched option BUT not both on a belt order. If I add a colored background to my floral pattern custom belt, will the color rub off or fade with wear over time? The back-grounding that is accomplished during the hand tooling process smashes the area that is back-grounded well down below the surface of the floral tooling and the edge border. One of the main purposes of a nice edge border is to provide protection for the tooled area of the belt as it slides in and out of the belt loops daily. So the back-grounded areas of a finished belt around the tooling is well below the surface of the belt and naturally protected from rubbing. We use oil based paint that is specially formulated for leather on our painted backgrounds. It adheres to the leather very effectively and will last a very long time and maintain its original appearance. Our son Roland wears a belt every day that he made for himself seven years ago that has a black background. It looks pretty much the same as it did five years ago. Why are your belts so expensive compared with belts that I see at the retail stores that also have floral patterns on them? Well, simply because the western belts hanging in the retail stores priced at $45.00 - $95.00 are manufactured with machinery at an extremely high rate of production. And, generally speaking, the leather in them is more often than not synthetic or a very poor quality leather. These belts are designed and manufactured for high profit margins. Our custom-made, hand tooled belts are in every sense a work of art. In similar fashion to an oil painter who begins with a blank canvas, takes brush in hand and creates something highly unique and original, we also begin with a blank strip of high quality leather and we create a belt to the customers specifications combining their choice of tooling pattern, style, finish, and also personalization. No two hand tooled belts are alike. They are all unique in the same way that fingerprints are never alike. A custom made, hand tooled belt has character and personality all it's own. There is also western heritage and tradition involved in all of our belts. in our methods for the patterns we carve into each belt, we are honoring the old, traditional hand tooling methods that have evolved over the past 150 years in the American West with respect to belt making. What we do truly is a craft - something unique and very difficult to master. The true value in a custom made, authentically hand-tooled belt is the artistry that is woven into every feature - truly made by hand with hand tools one feature at a time. We do use a sewing machine to install the stitched edge borders, and we also use a laser engraver to cut in the names, initials, and cattle brands. Most of the belts we create require from 4 - 8 hours of hand work to complete. I'm not all that familiar with the traditions of cowboy belts and hand tooled belts. With your floral patterns, are some designed for men and others for the ladies? That is another very good question. In reality, historically floral carving in traditional cowboy belts is not gender specific. Traditional working cowboys over the last 80 years or so were more prone to choose a floral tooling pattern if it appealed to them and they appreciated the artistry. There is no doubt that the original leather carving artists likely would have picked out a flower native to the area where they lived and worked and then designed a tooling pattern after it. This is the reason why that same pattern might have been appealing to the working cowboys - the design was replicating a flower or a vine from their home country. We are convinced that most floal tooling patterns originated with custom made saddles where there was more space for the leather artist to display any particular pattern. For example, the "Wild Rose" might have become popular with the Canadian cowboys of Alberta. 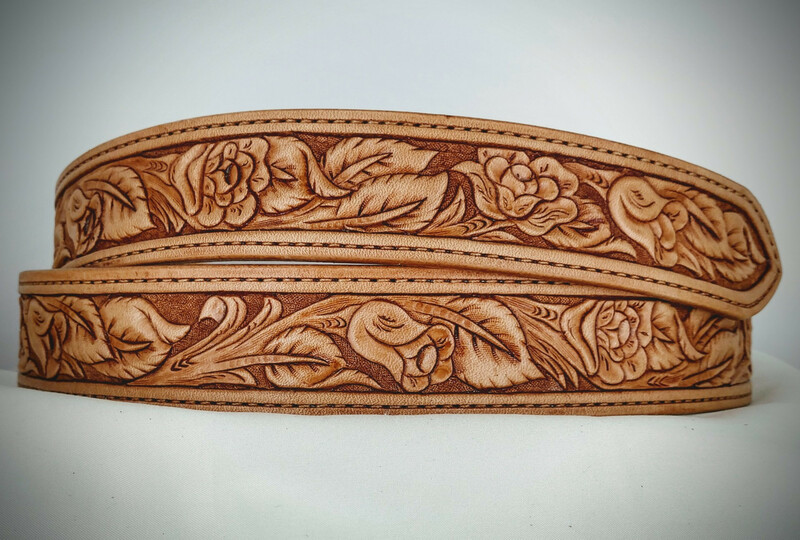 That is still true today - some of the world's finest and most spectacular floral tooling is currently done by highly skilled custom saddle makers here in the West. In our opinion, according to cowboy tradition, there is no valid reason to be concerned about any given tooling pattern being designed specifically for men or for women. Choose the pattern that is most appealing to your taste and enjoy! I have an old buckle set that was given to me by my grandfather 30 years ago. I think it is a 3/4" set. Can I ship it to you and have you folks install it on my new belt? Yes, we can definitely do that for you. In most cases, it is a much better option for us to have the buckle set when we build the belt so that we can cut the billets or the taper to the right width to suit the buckle set. Interestingly enough, buckle sets are not all built to a universal width - there can be some variation, especially in buckle sets made by the Navajo People and other Native Americans. The only thing to consider when sending us your buckle set is in the value of it. If your buckle set has a very high value or is a collector set, you may not want to send it to us for installation due to the possibility of it being lost in transit. If you do send us a very expensive set, please be willing to over the cost of adequate insurance both ways. How far will you ship your belts? We gladly ship to Australia and Canada as well as all 50 US states. Couldn't find your question? Ask away here!